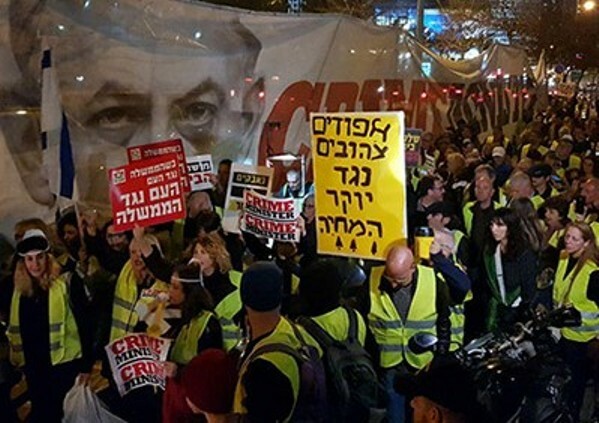 Hundreds of Israelis took part in a “yellow vest” demonstration in Tel Aviv on Saturday night, December 22, to protest government approved increases in the cost of basic commodities and utilities in Israel along with the corruption of the far-right government. During the demonstration, protesters blocked Tel Aviv’s Azrieli junction in both directions and marched along Kaplan Street to the center of the city chanting slogans against the rightist government and its leader. The marchers also held aloft red and Israeli flags and signs reading “Crime Minister” and “When the government is against the people, the people are against the government,” the latter with the symbol of Hadash. The protests, which began earlier this month, were inspired by the nationwide demonstrations in France over the past month and a half that were set off by an announced fuel tax increase. In Israel, protests have centered on a recent wave of announced price hikes for electricity, water, gas and mobile phone services, as well as for food products, insurance and property taxes. Last week protesters blocked the same Tel Aviv intersection for several hours. At that time, ten protesters were arrested but were soon released with conditions restricting their activity.